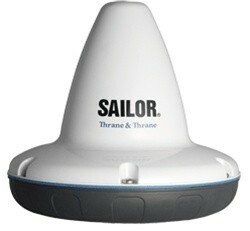 This innovatively designed antenna is compliant with all GMDSS requirements. With this spare part, you don't need to change the entire GMDSS system of the vessel. The antenna is based on the highly reliable and accredited Inmarsat-C technology by Danish Thrane-Thrane. In spite of its highly developed technology, the antenna is discreet, compact, and easy to install. 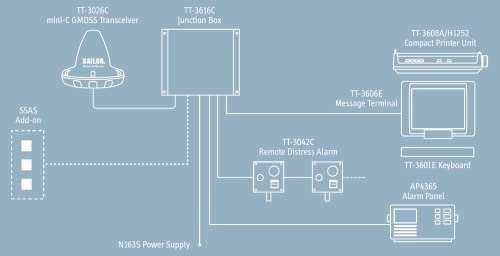 TT-3026M: the simplest tracking system incl VMS and email. Remember ! If you have old Inmarsat C system 4000 series with TT-3005M & TT-3020C which is broken, then you can replace it with TT-3026 miniC: we have sollution and all spares. Just send email to service@marine-electronics.eu or call us on +(45) 2670 9431 and we will revert with price affordable suggestion. All our mini C can be supplied with pole mounts and cables. We can programme the units with the particulars of the vessel so it can be replaced by the crew without need of the service engineer, which can be costly in remote areas. We are Number 1 suplier of GMDSS spares and equipment in Baltic Sea area. We have service engineers in each main port of Baltic Sea. We perform also service on GMDSS equipment incl. radio survey and we have aprovals from GL DNV, BV, LR, NK, Rina and even INSB. For radio surveys we quote fixed price including travel costs. When you order service from us, you newer receive unexpected high invoices: no other competitors can beat our prices. We reply to all inquires not later then 6 hours after receiving your inquiry. We are a global company and we deliver service and spares to well established shipowners in Europe and Far East.